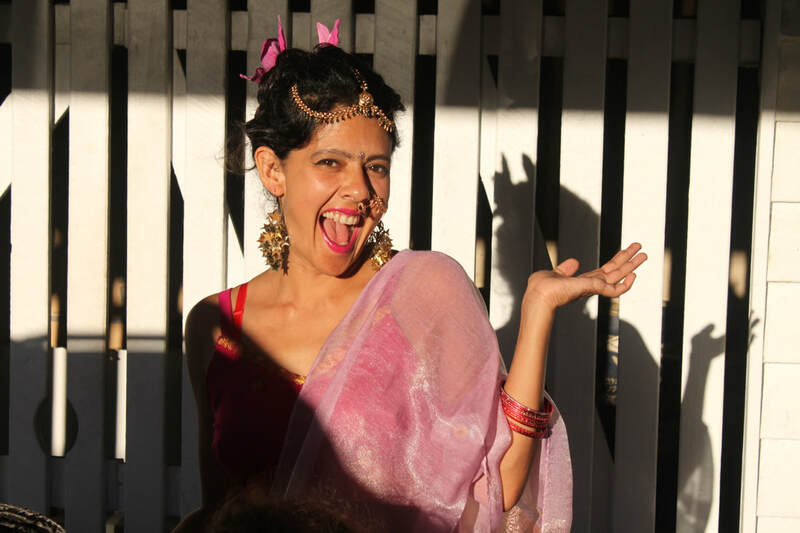 I am a mixed race artist, activist and documentary filmmaker. As a child I always loved drawing and painting but it is only in the last couple of years that I have decided to really dedicate myself to my art. In the meantime I have lived and worked in several different countries in a variety of jobs; constructing rural clinics in Tanzania, campaigning for women's rights and environmental justice, delivering media skills training to women activists in Eastern Europe, directing documentary films, running mental health workshops in the UK, art workshops for traumatised children in Sri Lanka, performance poetry, playing fiddle in a band, working with indigenous filmmakers and activists in Mexico, and boat building in Belgium, to name a few. In my early twenties I had the good fortune to be associated with Undercurrents, an an award winning alternative media production company using video as a tactical tool for environmental protection and positive social change. Camcorders were just becoming available to the public and for the first time activists could afford to make and distribute videos about their campaigns, bypassing the censorship and bias of mainstream media. Undercurrents trained me how to operate a camera, conduct interviews and basic editing skills. There was no stopping me! I went on to make several short films and documentaries, links to which can be found at the bottom of this page. After the 2004 Asian Tsunami I helped create and coordinate The art2art Project for tsunami and war affected children on the east coast of Sri Lanka. For almost three years the project ran regular art and drama workshops in several different locations reaching thousands of children. Each session would include group cooperative games to encourage the skills necessary for peace building and conflict resolution in these traumatised and war torn communities. I have suffered from mental health problems at various points during my adult life and have been forcibly sectioned in psychiatric hospitals several times. These experiences of experiencing reality in a very different way to the people around me, and the trauma I suffered as a result of my altered state of mind, as well as the institutional violence of the psychiatric system and forced medication, led me to make the documentary﻿ ﻿Evolving Minds﻿.﻿ The film is an exploration of the relationship between psychosis and spiritual experience and the alternatives to psychiatry. It had a big impact on people in the UK mental health survivor community and I spent a couple of years doing screenings of the film and running training workshops on the issues throughout the UK, not only for people suffering from mental health issues and their families, but also for professionals working in the system. Today, Mayan people are being attacked, evicted, murdered and imprisoned for defending their land and culture from destruction by multinationals and corrupt governments. I was deeply inspired by the humbleness of the people I interviewed and their commitment to fight for what they believe in despite the brutal repression they are facing. There is a deep connection between spirituality and social justice, which is embodied in contemporary Mayan culture with its’ struggle for environmental and social justice and spirituality based in love and respect for Mother Earth. The prophecies are a warning to us, that unless we make good our relationship with Mother Earth and the cosmos, we are, in the words of Juliana Batzibal “digging our own grave”. We need to learn to live in harmony with the elements, communicating with them in a way that is nurturing not only for our species, but for the whole interconnected web of life on our planet. 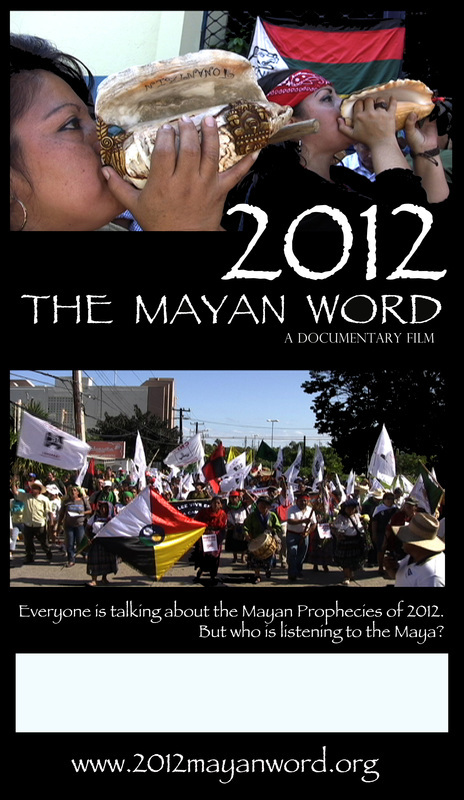 The resulting film I made, ﻿﻿﻿﻿2012 The Mayan Word﻿﻿﻿﻿ is both a message of hope and a call to action. In 2009 I was living in Chiapas, Mexico and working with a video activist organisation, Promedios, which works with Zapatista communities, training them to make documentaries. The Zapatistas are indigenous Mayan people who rose up in 1994 against the government, and took back their ancestral land to create their own autonomous communities. They now have their own systems of government, health care and education, based on their traditional knowledge and practices. At that time it was the build up to the Mayan Calendar change in 2012 and the media was generating a huge international industry of books, films and conferences about the prophecies. Contemporary Mayans however were angry about the way in which their culture was being hijacked and sold without their permission and often without even acknowledging their existence. The Mayan voice needed to be heard! I undertook a journey through their territory in Mexico and Central America and interviewed people from all walks of life, teachers, farmers, spiritual guides, activists, trade unionists and school children about their perspectives on the prophesies of their ancestors and their struggle to defend their way of life. It seemed to be more than chance that this great culture had given rise to both the prophecies and one of the most inspiring revolutionary movements of our time. Much of my working life has been directed towards environmental and social justice, mainly through training, educating and empowering people to bring about change. My paintings are my spiritual practice and offering to the world. I hope that you can derive strength, inspiration and peace of mind from them in this sometimes cruel and crazy, yet beautiful world. Contributor to the book OUTSIDE MENTAL HEALTH: VOICES AND VISIONS OF MADNESS. "What does it mean to be called crazy in a crazy world?" Contributor to the book TEACHING MENTAL HEALTH a training manual for mental health professionals. Scripture prize when I was 10. Bravery In The Face Of Madness Award. Loads more that I am too famous to remember.